There is a huge trend among baby photographers to do all of those awesome shots of babies all curled up and almost “in the womb” looking. 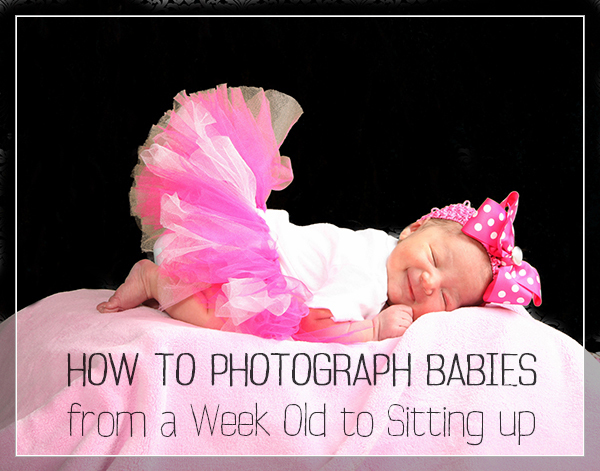 I LOVE those shots, but they have very definite parameters, meaning that you have to catch the baby while she is still curly; so 3 to 7, or sometimes, at the very oldest, 12 days old. So what if the baby was a preemie, or it’s cold out and the parents don’t want to bring the baby out? Or maybe the mom had a Caesarian, and just isn’t up to moving around that much, but still wants newborn pictures? The very most important thing is that the baby’s head is supported, and that the baby isn’t going anywhere. I remember one day, when my daughter, Zoe, was about three months old, just a little non-mobile lump of luscious baby, we were going on a trip, and I had to get my suitcase. I put her in the middle of our king sized bed, and walked ten steps to the closet, got the suitcase out, turned around, and she was gone. I couldn’t believe it…I looked everywhere but couldn’t find her, my husband didn’t have her… it was horrible. We finally found her wedged between the bed and the side table…she went from not moving at all to having rolled over a good three or four times in a row! So I like to keep the baby low to the ground. I put a gymnastics mat down on the ground, then I put three really firm pillows on the ground, all next to each other from front to back. Then I put a couple of blankets on the pillows, and then I put a beanbag on the blankets. The more blankets you put on the beanbags, the better the blankets look. I hollow out the beanbag, and put the baby on top. So she’s about three or four inches above the ground. Then I have the mom sit RIGHT THERE, maybe six inches from the baby, so that she can grab her just in case the baby stretches, or rolls, or needs some good patting. 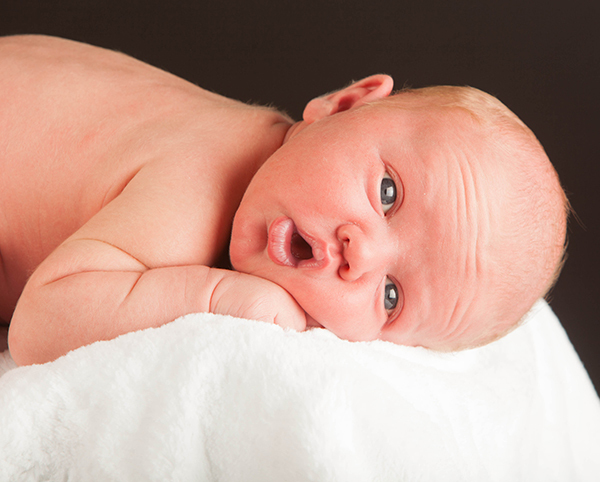 I know that the trend is sleeping baby, but I am of the opinion that even the tiniest of babies have a ton of expressions in them. This little guy was only two weeks old, with his little nursing blister in full bloom, and I love every little bald headed inch of him. His mom took his rattle and waved it in front of his eyes, then pulled it back hid it for a second, and then popped it back out, and he just looked so surprised and adorable… I loved it. Up in the Air? NO Way!! 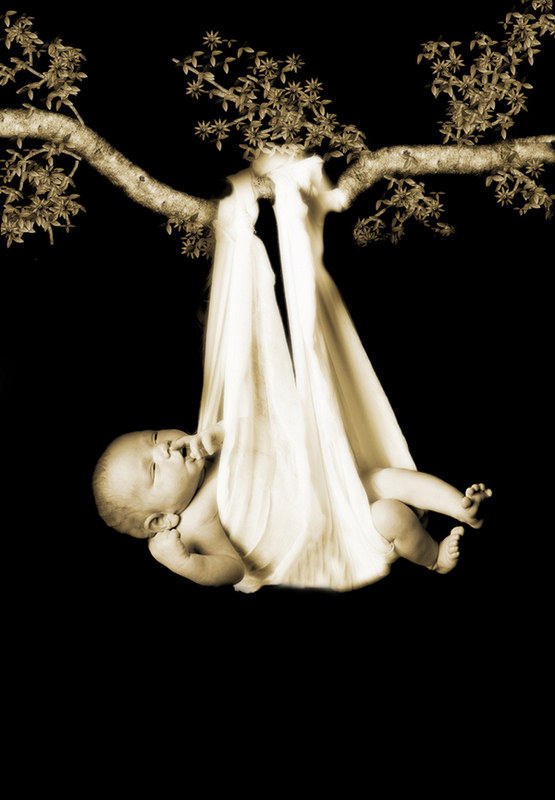 This “Hanging baby look “ has people up in arms because they think that the baby is up in the air, but I’m here to tell you that the baby is firmly on the ground. That’s the beauty of the two dimensional . All you do is take the wrap and lift it up. For some reason, when a baby feels pressure on the back of his legs, he usually just lifts his feet, making it look like he’s in the air. As they get a little older, and can push themselves up, you can put them directly on the paper. Give them something to look at, make a loud noise or have mommy sing the baby’s favorite song, and you’re in. You can also put the baby in a boppy, if they’re almost sitting up, or you can put the baby in a supportive box. Here I put this little four month old angel in an antique milk bottle box. He had a huge beanbag under him, plus about ten blankets to get him high enough out of the box, and to make sure that he didn’t hit anything unwieldy, and another smaller, cylindrical beanbag under his head , covered by the blanket, and he was so cushy and happy that he just started grinning away. A lot of the time, moms feel better about themselves when they have had time to get their bodies back, so they are more willing to pose. Bringing the mommy’s face closer to the baby’s is a great way to capture a really beautiful moment. Thanks so much to all of the people who entered my contest last week!! I had a lot of fun talking with Don, Andre, Simmi, Jazzy and Kelly, and hearing thoughts from dozens of others. Write me any time at barb@barbstitzer.com. I’ll get back to you, I promise! Let’s get better together! 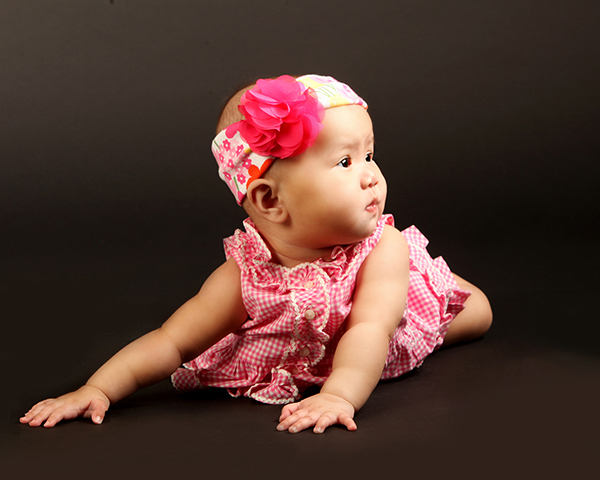 Read also how to photograph your baby with a special gift or toy!